After stepping into 30s, I no longer feel that I'm as energetic as I was. Then it dawned on me that my body is no longer young and functional like how it used to and I felt like there's no turning back. Until I discover about supplements such as collagen that has benefits of maintaining body in a healthy way. I started trying NH Colla Plus 3 recently and it's made by 100% natural ingredients and advance ingredients such as Tea Polyphenols, Yeast Ceramide and also Olive Extract. Slight bitter taste ( I like the taste! Less sweet is better!) and devoid from any preservatives, synthetic flavoring, coloring and chemical addictives. Collagen has been shown to heal and strengthen mucosal lining and low stomach acid, hence the healing digestives can incredibly heal the gut and soothe symptoms of irritable bowel syndrome, crohn's and ulcerative colitis. Collagen heals gut lining and solve intestinal issues. Another ageing trait of mine was pain in the knee cap, which I know is very very bad for my knees as the collagen around that area starts to decrease and causes my knee bones to rub against each and cause pain especially when I walking down the stairs. When joints, bones and cartillage are partially made by collagen, daily use of collagen supplements can improve joint pain and strengthen our bones, joints and cartillage if one uses collagen for a long period. As mentioned above, wrinkles cellulite and stretch marks happen when body produces less and less collagen (especially women T_T) and loss of collagen will leads to skin aesthetic issue such as wrinkles, sagging and sallow skin. Although there are skincare that contains collagen, but consuming collagen is the most effective way to supply collagen to body. Collagen will help skin remain firm and elastic so our skin won't have connective tissue breakdown problem hence skin won't have cellulite or stretch marks issue. Yeast Ceramide in NH Colla Plus 3 helps hold skin together, forming a barrier for skin to block polluted environments and support skin structures prevents wrinkles and lines. When our hair and nails are made up mostly of keratin, a type of fibrous protein, it needs amino acids to grow. While collage is a type of protein made up of amino acids, if our body has lots of collagen, it will fasten the growth of hair and nail. If you have weak and brittle nails and hair, do make sure you're consuming enough collagen for body to absorb to see improvement of hair and nails. Inflammation is the natural response of our body to harm. If we knock our knees at the corner of table, knee will turn red and swollen which is the sign of inflammation. Same as wounds, collagen helps reduce inflammation and heals body and skin in a faster pace. 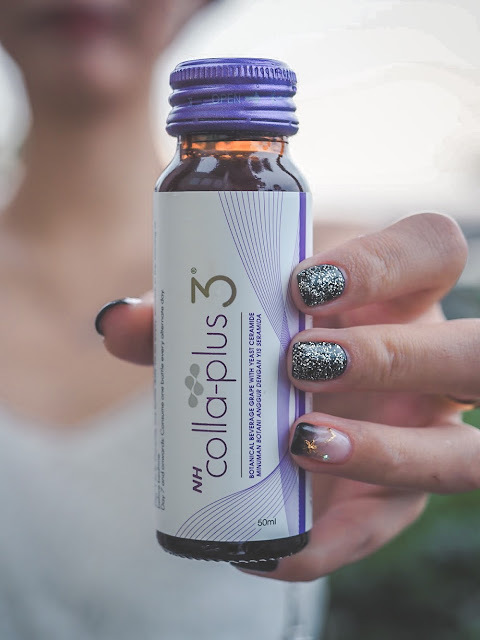 Although I just started drinking NH Colla Plus 3 for about a week, I already can see the signs of improvement both body and energy. I felt more energetic even though I averagely slept 3 - 5 hours for the week (due to work and travel) and my skin seems brighter and smoother than before. I kinda think I made a good decision to bring NH Colla Plus 3 with me to Japan so I can continue my collagen intake everyday and still feeling great!